Ronald Cruz (18-2, 13 KOs) powered his way back into the win column Saturday night in Bethlehem, PA, making short work of Mexican Rodolfo Armenta (12-12-1, 9 KOs). Cruz won the scheduled 8-rounder by knockout at 2:40 of round two. The victory came as a great relief for Cruz, who after two consecutive decision losses, had described this fight as a must win situation. Clearly Cruz began the bout with knockout on his mind. He pressured Armenta from the opening bell, and began landing with authority immediately. 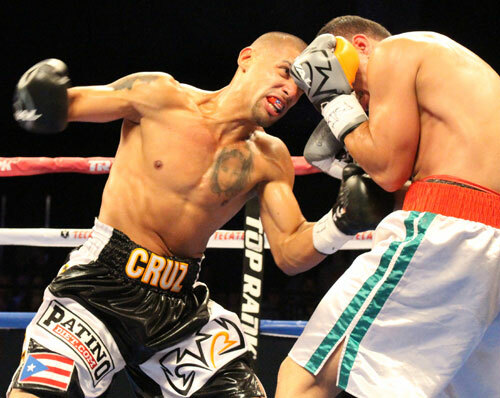 Forward motion, a good body attack, and hard shots to the head was the key to Cruz' success. In round two, Cruz staggered his opponent with a short left hook. Not willing to let his chance for a quick win pass, Cruz followed up with another hook and a right hand that put Armenta down in the red corner. About halfway through referee Gary Rosato's count, Armenta's corner tried to surrender with the wave of a white towel, on the opposite side of the ring. 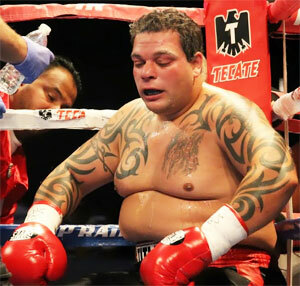 However, Rosado continued counting until he reached the final 10. The victory rebooted Cruz' suddenly slumping career and ignited his hometown crowd at the Sands Casino Resort in Bethlehem. They never doubted their man's ability, but the pro-Cruz crowd must have felt as relieved as Ronald to see him back on track. 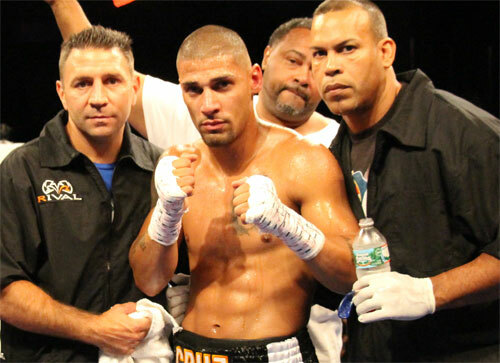 "I told you I was going back to being Ronald Cruz, banging guys to the body and breaking fighters down," Cruz said. Clearly Armenta was a "comeback" opponent, but it was equally obvious that this was a rejuvenated Cruz, seriously motivated to change the course of his career. The result was exactly what the Bethlehem welterweight needed. "I think it was the combination of body and head shots," Cruz said. "I felt the wind come out of him every time I hit the body. I wanted to hit the chin, but first I had to get to the body. So that's what I did." Lemuel "Indio" Rodriguez, Cruz' trainer, was satisfied with the win. "I'm real happy," he said. "We were working. I was preparing Ronald for a different Ronald. More angles, throw more, jab more, more patient. Finally everything we were saying the last two fights came out today. I been telling you for a long time, just give me time. Everything little by little." "Exactly," Cruz said. "I went out there and did what my trainer and corner expect me to do. That's what I did." 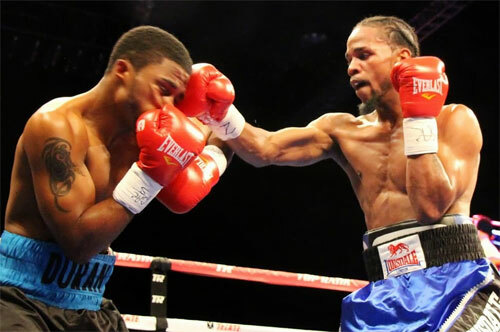 The Bethlehem show was a collaboration between Top Rank and Peltz Boxing. Top Rank brought in the main event and a few of their hot prospects, while Peltz filled out the remainder of the card with local talent. One fight that overlapped both promotional interests was the walkout 4-rounder featuring Jesse "Hard Work" Hart, a Philadelphia product who is promoted by the powerful Top Rank. On Saturday, Hart rematched with Steven Tyner of Akron, Ohio, the only man to last an entire fight against the rising star. 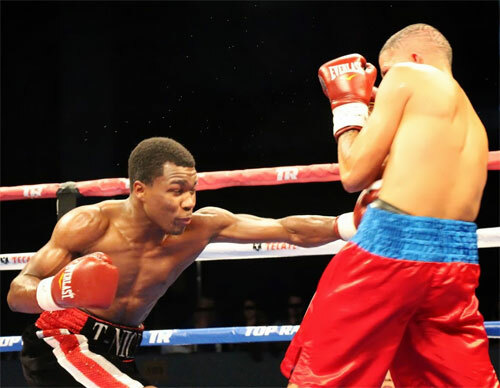 Last December, Tyner stopped Hart's 4-bout knockout streak, but this time was a different story. Hart zoomed out in round one and caught Tyner with a hard right that immediately dropped him. Moments later, Hart drilled Tyner with a left hook that put him down again and prompted referee Steve Smoger to call a halt to the fight. The time was 1:22. The quick win was the ninth in a row for Hart, 9-0, 8 KOs. 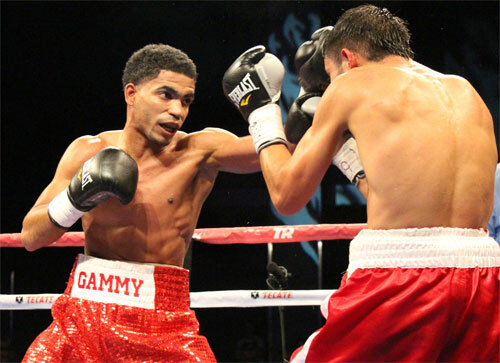 Tyner fell to 3-12-2, 2 KOs. The sudden KO ended a rather long evening. Cruz and Hart scored the only knockouts on the 8-bout card. In the main event, Gamalier Rodriguez (22-2-3, 15 KOs) won a one-sided 10-round unanimous decision over Jorge Pazos (9-6, 3 KOs) to earn the NABO featherweight title. Rodriguez did everything better in the bout and cruised through the job with ease. All three judges scored it a landside, 98-92 and 99-91 twice. 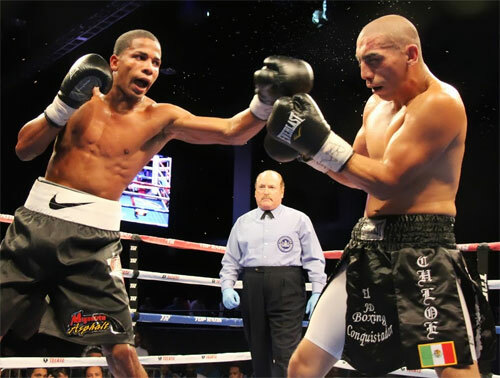 Lauded lightweight prospect Felix Verdejo (7-0, 5 KOs) won a unanimous 6-round decision over southpaw Guillermo Delgadillo (4-5-1, 0 KOs). Verdejo scored bookend knockdowns with a left hook in round one and a right hand in the final round. 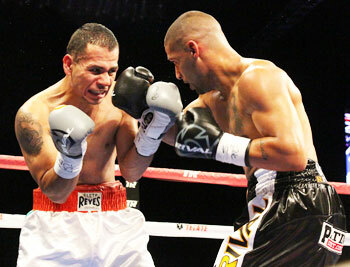 In between, it was all Verdejo, but Delgadillo was a game and durable opponent for the envisaged star. All three judges scored the fight 60-52 for Felix. Junior welterweight Toka Khan Clary (7-0, 5 KOs, 1 NC) remained undefeated with a 4-round sweep of Jose Valderrama (3-5, 3 KOs). The southpaw won every round on the official cards. 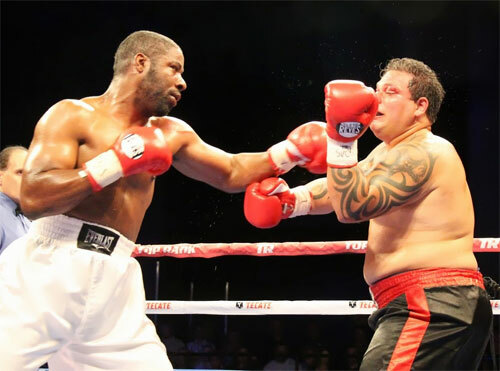 The night started with a 4-round heavyweight rematch between Allentown's William Miranda and David Williams of Philadelphia. In December, the two fought to a draw over 4 rounds. On this night, Williams kept his jab in Miranda's face and landed enough power shots to take the fight. Miranda stayed in there and had his best round in the second when suddenly he began landing the old one-two. but the variety of punches Williams landed through out the fight kept him up on the cards. 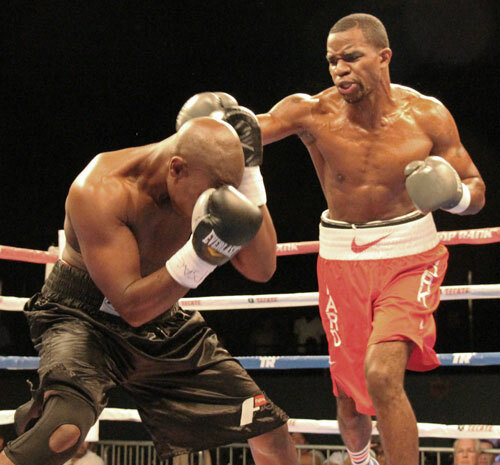 Williams (7-7-2, 2 KOs) won on all three official cards, 40-36-, 39-37 & 39-37. After the fight, the recently married Miranda (6-7-2, 0 KOs), indicated he would end his entertaining ring career. Over the weekend on Facebook, Miranda wrote, "The fight yesterday didn't go as planned. I've always given the best effort I could and fought with heart and determination to give people the best show I could. It's now time to go in another direction. I'm now happily married and the passion for boxing isn't the same anymore. It's an all or none sport, and with that I've decided to hang up the gloves. I'm officially done fighting. Thanks again to everyone for giving me the opportunity to live a dream and be a pro athlete." Miranda was a always fun to watch and will be missed, especially by his loyal fan Allentown/Bethlehem fan base. Allentown junior welterweight Jerome Rodriguez (5-0-1, 2 KOs), won a 6-round unanimous decision over Ariel Duran (7-6-1, 4 KOs), and looked very good in the process. Rodriguez, a stablemate of Ronald Cruz, won all the rounds on my card. Duran never hit the floor but at least two of the rounds were so dominated by Rodriguez that they could have been scored 10-8. I did not go that far, nor did any of the judges who turned in cards that read 60-54, 59-55 twice. 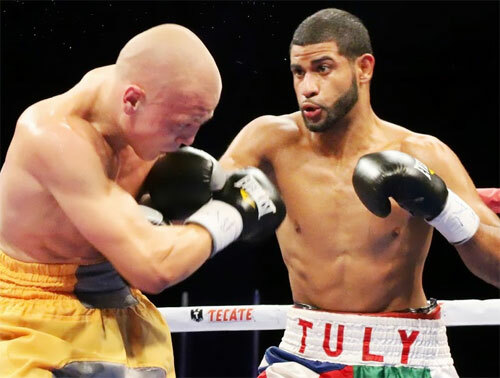 Easton, PA welterweight Arturo Trujillo won his second straight fight (2-0, 1 KO) with a 4-round points win over Yurii Polishchuk (1-1, 1 KO), a Ukraine fighter from Alexandria, VA. 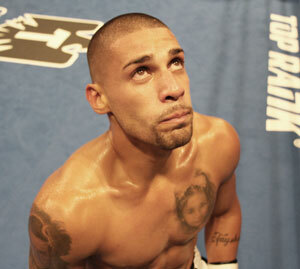 In round two, southpaw Trujillo knocked his opponent to the deck with a right uppercut. The punch landed more than once, but Polishchuk remained on his feet and made it to the final bell. All three judges scored the fight 40-35 for Trujillo.